Breast cancer is by far the most common cause of cancer-related death for women in China . Based on the expression of estrogen receptor (ER), progesterone receptor (PR) and human epidermal growth factor receptor-2 (HER-2), breast cancers can be categorized into five different molecular subtypes and each subtype has its own characteristics in the clinicopathological features, therapeutic methods and prognosis. Triple-negative breast cancer (TNBC), which is denoted by negative expression of ER, PR and HER2, constitute a heterogeneous group of breast cancers that largely coincide with the basal-like subtype [2, 3]. With heterogeneity and uncharacterized molecular pathways, TNBC has attracted more attention both clinically and experimentally because of its highly metastatic potential, poor prognosis and insensitive to hormonal or targeted therapy [4-6]. The aggressive behavior of TNBC cells is closely dependent on the tumor microenvironment. The fibroblasts, known as cancer-associated fibroblasts (CAFs), are the predominant stromal cell type in tumor microenvironment. CAFs are distinct from fibroblasts in their expressions of alpha-smooth muscle actin (α-SMA) and fibroblast activation protein (FAP), and are known to play a critical role in tumor growth, angiogenesis, and treatment resistance [7, 8]. Several studies demonstrated that high activation of fibroblasts was associated with poor outcome in various tumors [8, 9]. Aside from CAFs, macrophages are also abundant in the tumor stroma at all stages of tumor progression and are known as tumor-associated macrophages (TAMs). Clinicopathological studies have demonstrated that high infiltration of CD163-positive TAMs is associated with poor prognosis in various cancers, including patients with TNBC [10,11]. Accumulating researches have shown that CAFs and TAMs are synergistically related with cancer progression and prognosis of patients [12-16]. However, the precise mechanisms driving the interaction and cross-talk between these cells remain unclarified. We speculated that CAFs might induce TAMs infiltration and consequently promote TNBC metastasis. In our study, we examined the correlation of CAFs and TAMs in TNBC, and analyzed their associations with clinicopathological features including lymph node metastasis and prognosis. This study included 278 female TNBC patients (the lack of ER, PR and HER2 expression) without evidence of distant metastasis at the time of operation. Tissue samples were obtained from Nanjing Drum Tower Hospital and Jiangsu Cancer Hospital. All specimens were pathologically reassessed independently by two breast pathologists according to the 7th edition of the American Joint Committee on Cancer (AJCC) of Breast Cancer . None of these 278 patients received neoadjuvant chemotherapy or radiation therapy before operation. This retrospective study protocol was approved by the clinical research ethics committee of both hospitals, and complied with the Declaration of Helsinki. Informed consent was obtained from all participants or relatives. All the tissues specimens (4-μm-thick) were fixed in neutral buffered formalin and embedded in paraffin wax. Tissue sections were placed on charged glass slides, and then were subjected to deparaffinization in xylene and rehydration in a graded series of ethanol. Antigen retrieval was performed using citrate buffer at pH 6.0. Specimens were incubated with the antibodies against CAFs markers, and CD163 overnight at 4°C and washed in PBS for 10 min. Information on antibodies was listed in Table 1. The streptavidin-peroxidase technique (SP-9001 Golden Bridge Int, Beijing, China) was used. An irrelevant rabbit anti-serum served as a negative control. The slides were stained with 3-3'-diamino-benzidine solution followed by counter-staining with hematoxylin. All the slides were evaluated by two independent pathologists (X.Y.X. and S.Q.) who were blinded to the clinicopathological characteristics with consensus. All immunohistochemical markers were assessed via light microscopy (Carl Zeiss microscopy GmbH, Jena, Germany). The expression levels of each marker in cancer cells, stromal fibroblasts and macrophages were independently evaluated. Immunohistochemistry data were evaluated as “low” or “high” expression, regarding the rate of positive cells for each sample and each marker as previously described [11, 18-21]. All the data were analyzed by Statistical Package for the Social Sciences (SPSS Inc., Chicago, IL, USA) for Windows version 17.0. The correlation between α-SMA, FAP and CD163 and clinicopathological features was analyzed by the chi-square test. The association of the expression level of CD163 with the activation of CAFs was analyzed by the Spearman's rank correlation co-efficient. The disease-free survival (DFS) and disease-specific survival (DSS) were the designated end-points. DFS was defined as the time from surgery to any local, regional, or distant disease; diagnosis of a second cancer other than breast cancer; or death from any cause. DSS was defined as the time period usually begins at the time of diagnosis of breast cancer or at the start of treatment and ends at the time of death. Patients who died from causes other than breast cancer are not counted in this measurement. All outcome results were reported as of May 31, 2016. Survival curves were calculated using the Kaplan-Meier method, and compared by log-rank test. DFS and OS rate curves were calculated through the Kaplan-Meier method. Multivariate analyses were analyzed by the Cox regression model. The p values <0.05 were considered statistically significant. The relationship between expressions of CAFs and TAMs markers and clinicopathological features of TNBC patients were described in Table 2. The study included 278 women, ranging from 20 to 84 years of age (mean, 57.8 years). More than half of the patients presented positive with lymph node (LN) (55.8%, 155/278), and patients presented with lymphovascular invasion (LVI) were 37.8% (105/278). Most cancers were larger than 2 cm. As for histologic grade, more than two-thirds (68.0%, 189/278) of cases were grade 3. Ductal breast cancer was the predominant type, accounting for 94.6% (263/278). The expressions of CAFs and TAMs markers were found predominantly in stromal cells and slightly in cancer cells in TNBC tissues. In stromal fibroblasts adjacent to cancer nests, α-SMA was reflected as brown cytoplasmic staining, and FAP was expressed on the cell membrane and in the cytoplasm. CD163 was detected on the cell membrane or in the cytoplasm of the macrophages both in tumor nests and stroma. High and low expressions of the above-mentioned proteins, according to typical IHC staining patterns, in breast cancer tissues were shown in Figure 1. Of the 278 patients, high expressions of α-SMA and FAP, were detected in 50.4% (140/278) and 52.5% (146/278) patients of TNBC, respectively. 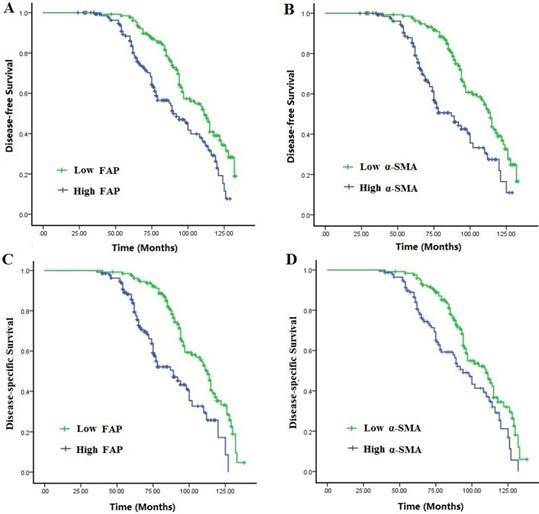 The high expression rates of α-SMA (59.4%, 101/170) and FAP (63.5%, 108/170) in patients with recurrence were significantly higher than that without recurrence (P<0.001, respectively). The expressions of CAFs markers were also significantly correlated to the histological grade and aggressive behaviors of TNBC. High expressions of TAMs marker CD163, observed around the tumor nests in 148 cases (53.2%), was closely related to the aggressive behaviors, such as advanced TNM stage, nodal metastasis, LVI and so on. The relationship between expressions of CAFs markers and CD163 were counted and has been described in Table 3. It was noted that expressions of CAFs markers in the 278 TNBC tissues were 50.4% for α-SMA and 52.5% for FAP. High infiltration of TAMs in neoplastic cells was also found in more than half cases. In overall patients, high infiltration of CAFs (α-SMA and FAP as markers) was significantly correlated with high infiltration of TAMs surrounding the cancer nests in TNBC tissues. As for recurrent cases, we found almost the similar results. In the same samples, we also found that high activation of CAFs was significantly correlated with lymphatic metastasis (Table 4). The follow-up time ranged from 8 to 130 months (median 87 months) and ended at May 31, 2016. When the follow-up was over, 197 patients were alive, including 90 cases without and 107 cases with recurrence, while the remaining 81 cases were dead (12 died of other accompanied diseases and 69 died due to tumor relapse). Survival curves were analyzed by the Kaplan-Meier method and compared using the log-rank test. The mean survival time was 69.42±19.68 months for all cases, and the 5-year DFS and DSS were 79.0% and 83.1%, respectively. Compared with those with low expressions of CAFs markers, patients with high expressions had a disadvantageous DFS and DSS (P<0.001). Multivariate Cox analysis showed that elevated activation of CAFs, high TAMs infiltration and lymphatic metastasis were independent worse prognostic factors for DFS and OS rates in TNBC patients (P<0.05) (Fig. 2A-B, Table 5). In this study, we selected a cohort of 278 patients in order to analyze whether CAFs correlated with TAMs infiltration, lymphatic metastasis and could predict outcome for TNBC patients. The results of the present study supported the speculation that high activation of CAFs correlates with infiltration of TAMs, lymph node metastasis and contributes to poor prognosis in TNBC. The results also demonstrated that age (45.6 vs. 54.4%), histological type and menopausal status (54.4 vs. 45.6%) did not significantly affect the activation of CAFs and infiltration of TAMs. In the present study, we found that patients with aggressive features such as lymph node metastasis, large size, and high histological grade possessed with high expression of CAFs markers and elevated of TAMs infiltration. In addition, CAFs markers significantly correlated with CD163 expression and lymph node metastasis. In the current study, we also manifested that CAFs markers significantly correlated with CD163 expression and lymph node metastasis, especially for those with recurrence. The combination of CAFs and TAMs within a tumor site has been reported to be a potential prognostic factor in multiple solid cancers, such as oral cancer, neuroblastoma and colorectal cancer patients [12-14]. In the present study, Multivariate Cox showed that activation of CAFs, high TAMs infiltration and lymphatic metastasis were independent worse prognostic factors in TNBC patients. In breast cancer, CAFs are key players in the tumor microenvironment since they not only promote tumorigenesis, cancer evolution and therapeutic resistance, and targeting CAFs would provide a novel strategy for anti-cancer treatment [7, 22]. Recently, accumulating researches have focused on the role of CAFs in TNBC. Increased collagen expression in tumors is associated with increased risk of metastasis, and TNBC has the highest propensity to develop distant metastases when there is evidence of central fibrosis. CAFs can regulate TGF-β ligands to promote accumulation of fibrosis and cancer progression. By targeting the CAFs with Pirfenidone (PFD) in combination with doxorubicin, could inhibit tumor growth and lung metastasis synergistically . Hu C et al. Shown that regulating CAFs with losartan-loaded injectable peptide hydrogel could potentiate the effect of chemotherapy in inhibiting growth and lung metastasis TNBC . The study conducted by Wang M et al. demonstrated that CAFs autophagy can enhance TNBC cell migration, invasion, and proliferation, and induce EMT process through the Wnt/β-catenin signal pathway . Detection of CAFs activation ( α-SMA and FAP ) and TAMs infiltration ( marker CD163 ) in TNBC tissue by IHC. High CAFs activation and elevated infiltration of TAMs was seen in more aggressive cancer. A-B: high expression of α-SMA ( A: 200 × ; B: 400 × ) and C-D: high expression of FAP ( C: 200 × ; D: 400 × ) ; E-F: Strong immunoreactivity of CD163 ( E: 200 × ; F: 400 × ). Disease-free survival (DFS) and disease-specific survival (DSS) of the 278 patients with TNBC in relation to α-SMA and FAP expressions in CAFs. Patients with high activation of CAFs had a worse DFS and DSS than those with low activation. In this retrospective study, our results suggest that CAFs were correlated with TAMs infiltration in patients with TNBC. 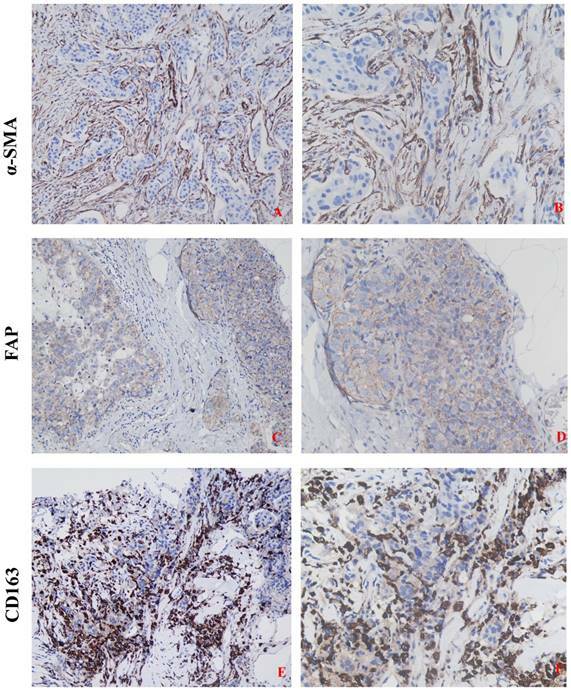 High expressions of α-SMA and FAP were correlated with elevated expression of CD163, and CAFs might play an important role in shaping the tumor immunosuppressive microenvironment by regulating protumoral phenotype of TAMs. However, the exact mechanism of CAFs polarize macrophage is not yet clarified in TNBC. The research conducted by Kumar V et al. has demonstrated that CAFs are major sources of chemokines that can recruit and induce PMN-MDSC infiltration to neutralize the anti-tumor effect of CSF1 receptor blockade to eliminate TAMs . Crosstalk between stromal components and TNBC cells could enhance TNBC tumor growth and metastatic extravasation and colonization, and the IL-8-CXCR1/2 signaling acts as a key regulator orchestrating TNBC metastatic breast cancer via TNBC crosstalk with CAFs and TAMs . The findings of Tashireva LA et al. has shown the heterogeneous distribution of fibroblasts and macrophages in breast tumor microenvironment and its close relation to the intratumoral morphological diversity of BC and contribution to lymph node metastasis . In breast cancer, CAFs could promote an immunosuppressive and growth-promoting microenvironment through the induction and accumulation of protumoral macrophages via secretion of Chitinase 3-like 1 . In turn, TAMs can affect collagenous matrix remodeling through their regulation of collagen production by CAFs and induce myofibroblast differentiation [30, 31]. Therefore, due to the enrichment in reactive CAFs and M2-like macrophages in TNBC stromal, the crosstalk between CAFs and TAMs might be a potentially novel target in ameliorating the pro-tumorigenic microenvironment. Our data show that CAFs activation correlated with TAMs infiltration and lymph node metastasis, and there may be exist a fascinating loop among CAFs, TAMs and cancer cells, in which the interaction between stromal and cancer cells allows for the establishment of a pro-inflammatory microenvironment to promote cancer progress. In keeping with our findings and these reports, the combination of TAMs and CAFs could be a potential prognostic factor and also a potential therapeutic target in TNBC. This work was supported by grants from the National Natural Science Foundation of China (Grant Nos. 81201909, 81572338 and 81672380), Nanjing Medical Science and Technology Development program (Nos. YKK12072 and YKK15061). This work was also a C class sponsored project of Jiangsu provincial Six Talent Peaks (WSN-078).